The World Mission Society Church of God attempts to prove the existence of a “mother god” with their interpretations of Galatians 4, Revelations 21, and Revelations 22. In our last article, “An Interview With The NCPCOG: Ahnsahnghong Believed The Idea Of A ‘Mother God’ To Be Delusional“, we examined how Ahnsahnghong disproved the argument that Galatians 4:26 refers to a “mother god” in his book entitled “새 예루살렘과 신부 여자들의 수건 문제 해 석” or “Problems with the New Jerusalem, the Bride and Women’s Veils”. Ahnshanghong wrote this book in response to a woman named UmSooIn, who some allege was Ahnsahnghong’s first “spiritual wife”, that claimed she was the “mother god”. Who Did Ahnsahnghong Believe The Bride In Revelation 22 Represented? – Ahnsahnghong, Problems with the New Jerusalem, the Bride and Women’s Veils, Ch 16. 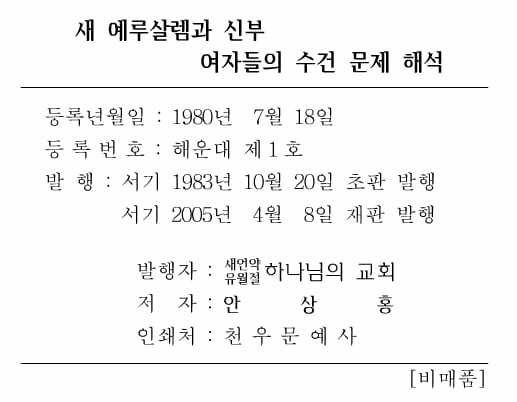 Ahnsahnghong goes on to argue that UmSooIn’s voice cannot be the voice from the throne of God in Revelation 21:3 because before that Revelation 21:1 states, “Then I saw a new heaven and a new earth, for the first heaven and the first earth had passed away, and there was no longer any sea”. Ahnsahnghong also sites 2Peter 3:6-13 to further clarify that the events in Revelation 21 are to take place after the earth is destroyed by fire. Who Does The WMSCOG Believe Represents The Bride In Revelation? Ahnsahnghong believed that the “bride is the heavenly Jerusalem”. Why does the WMSCOG claim that the bride represents ZhangGilJah? Ahnsahnghong believed that UmSooIn was a “psychopath” for claiming to be the bride and Jerusalem. UmSooIn’s claims were made with the same verses and interpretations that the WMSCOG uses to claim that ZhangGilJah is Jerusalem, “mother god”, and the bride (these terms are synonymous to members of the WMSCOG). Ahnsahnghong’s book “Problems with the New Jerusalem, the Bride and Women’s Veils” was first published in 1980, only 5 years before his death and ZhangGilJah’s subsequent similar claims to divinity. Would Ahnsahnghong think that ZhangGilJah is also a psychopath if he were alive today? Ahnsahnghong warns that there will be inescapable punishment for those that choose to follow and believe UmSooIn’s claims to be the bride, Jerusalem, and “mother god”. Yet the WMSCOG teaches its members that they “need our Jerusalem Mother, the Bride so that we can receive eternal life“. Who’s words do you believe? Ahnhanghong’s writings or the World Mission Society Church of God’s claims? It is difficult to fathom how a WMSCOG member could ignore these contradictions and remain within the group. WMSCOG members are here encouraged to examine the evidence with the minds that God has given them ( 2 Timothy 1:7 ). The truth has nothing to fear from questioning, because it can always stand up to scrutiny. If it can’t, it simply isn’t the truth. This church has to be stopped. They go against their own writings. I feel very sorry my friends that still belong to that church. I don’t see them much since they completely shunned me out of their lives. I wish I could show them this proof that Ahn claims there’s no mother god. It’s really sad that I can’t tell them. They would probably report and get me to sign those documents like the young women that was asked to in “How WSMCOG turned my life upside down.” If only Ahn could be alive today and see how his people turned against him and made him a bad name.